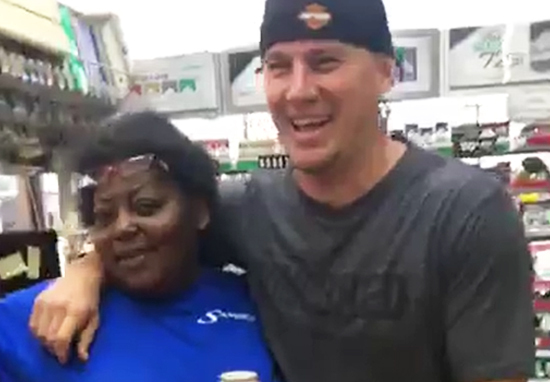 Channing Tatum made a busy petrol station cashier smile after dancing with her as he bought some snacks. 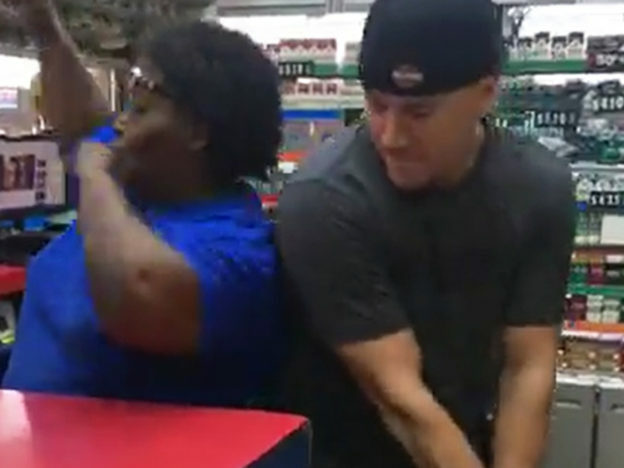 The lady, a huge fan of Channing, demanded a hug when she caught the 37-year-old actor perusing the sweet aisles. Confident Beatrice took her chance and shouted to Channing, ‘get over here’ before the pair introduced themselves and continued to chat – luckily for her, nimble footed Channing was up for having some fun. Channing decided to crank up the tunes and began to break out into some pretty recognisable dance moves. Beatrice danced alongside Channing, acting as cool as a cucumber as she enjoyed a memorable moment with the Hollywood heartthrob. Fans of Channing’s film, Magic Mike will have undoubtedly noticed that Mr Tatum was in fact recreating the steamy scene from Magic Mike XXL, where Joe Manganiello performs a strip tease inside a convenience store. Beatrice was grinning from ear to ear as the pair continued to show off their moves. Channing shared the brilliant moment on his social media, uploading the video to his Facebook. Nothin’ better than a little dance party. Channing, if you’re reading, please come on over to our workplace at UNILAD !